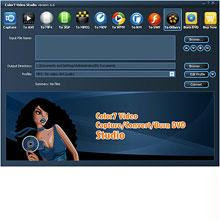 Color 7 Video Capture/Convert/Burn DVD Studio is refined as premier software in video realization.It can : convert between all most-used video formats,such as AVI (DivX, XviD, etc), MPEG 1,2 and 4, QuickTime, Real Video, WMV and DVD, SVCD, VCD; capture from DV, log cam, web cam, VHS, VCR and online video streams,start making your movies from the first run; create DVDs from video files of all supported formats to watch them on your home DVD player with friends and family; control and play videos in DV, log cam, web cam, VHS, VCR and online video streams; extract audio tracks from video, and save them into different files; grab pictures from original videos. Both BMP and JPEG formats are optional in output...and much more!! This software is the only ticket you need, from raw videos to any most-used video,within 4-steps, Color 7 Video Capture/Convert/Burn DVD Studio will express your creative ideas and share them with your friends.